The average uninsured rate in states that use the federal HealthCare.gov exchange is nearly double that of states that set up their own public health insurance exchanges, data released by the CDC shows. In the first six months of 2017, HealthCare.gov states had an average uninsured rate of 16.1%, while states with their own exchanges—like California and Colorado—had an average uninsured rate of 8.3%. The disparity in coverage in states that use HealthCare.gov and those with state-based exchanges can be explained, at least in part, by Medicaid expansion. 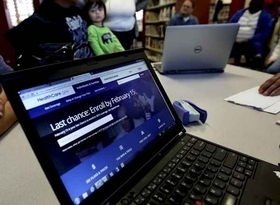 "States that went all in on implementing the ACA set up their own exchanges, but crucially also expanded Medicaid," said Larry Levitt, senior vice president at the Kaiser Family Foundation. He added that many states with their own exchanges have been more aggressive in outreach, which may have also helped lower the uninsured rate in the state. Nearly all of the 12 states that run their own exchanges have expanded Medicaid under the Affordable Care Act, so people with incomes up to 138% of the federal poverty level have access to Medicaid coverage. Meanwhile, 17 states that use HealthCare.gov or partner with the federal exchange for some functions opted not to expand Medicaid. A growing body of evidence has shown that states that expanded Medicaid in general have lower uninsured rates and healthier individual marketplaces. According to the Centers for Disease Control and Prevention data, the uninsured rate among adults age 18 to 64 residing in Medicaid expansion states was 8.8% in the first six months of 2017, down from 18.4% in 2013. But in states that didn't expand Medicaid, the uninsured rate is 19% in the first half of 2017, down from 22.7% in 2013. The CDC also found that the percentage of people enrolled in a private health insurance plan with a high deductible climbed to 42.9% in the first half of 2017 from 39.4% in 2016. The percentage has increased every year since 2010, when 25.3% of privately-insured individuals were enrolled in high-deductible plans. High-deductible health plans have a deductible of at least $1,300 for self-only coverage and $2,600 for family coverage. In total, 28.8 million people of all ages, or 9% of Americans, were uninsured in the first half of 2017, about the same amount as in 2016. Among adults age 18 to 64, the uninsured rate was 12.5%. About 176.8 million people, or 65.4%, under age 65 were covered by private health insurance plans in the first half of this year, including 10.1 million, or 3.7%, covered by the ACA exchanges.